Honestly, I’m a bit embarrassed to tell this story, even though I’m sure there are others out there with similar experiences. Most of you who know me know that I’m not a typical “girl.” I’ve always pushed aside traditional gender roles; basically, I do whatever the hell I want — and I usually do it pretty darn well. So the fact that I failed miserably in my first attempt to ride a motorbike in Thailand is tough to admit, especially when you consider all the things I did growing up. 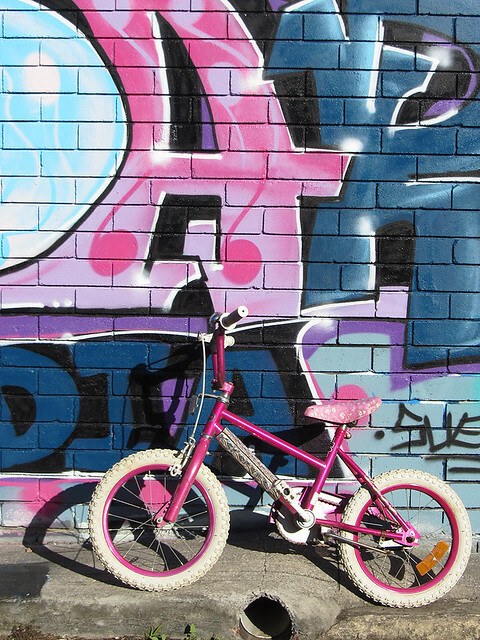 As a child, I rode my bike everywhere and was known to be quite the dare devil. On weekends, the road outside our house was filled with obstacle courses and homemade jumps for our bikes. Looking back on it now that I’m an adult, I’m surprised my mother didn’t put a stop to it — it was ridiculously dangerous (thanks mom!). Most of the time, the tricks we pulled off were impressive. Other times, it didn’t end well. In fact, I knocked myself out in a bike crash at the end of a race once (a very bizarre experience to an 8 year old). I just remember the finish line…and waking up in my bed! I even knocked out a tooth on another occasion (luckily, it was only a baby tooth). Also since I grew up in Idaho, I’ve basically been riding ATV’s since I was 6 (we had a miniature ATV for kids – super safe, I know!). So I spent my childhood riding 3 and 4-wheelers all around my grandparent’s house in the countryside, and up in the mountains. While in the mountains, I would always take trips deep into the woods, crossing rivers, and going up and down steep hills. I’ve made it through some crazy experiences on those ATVs, including getting stuck in huge mud lakes, and tumbling down the side of mountains. In fact, after one of my unsuccessful stunts in the mountains on an ATV, my aunt dubbed me “Motorcycle Mama” — at the time, I was not amused by the name. Yes, that is a family on a motorbike. And is a conservative number of people on the bike! 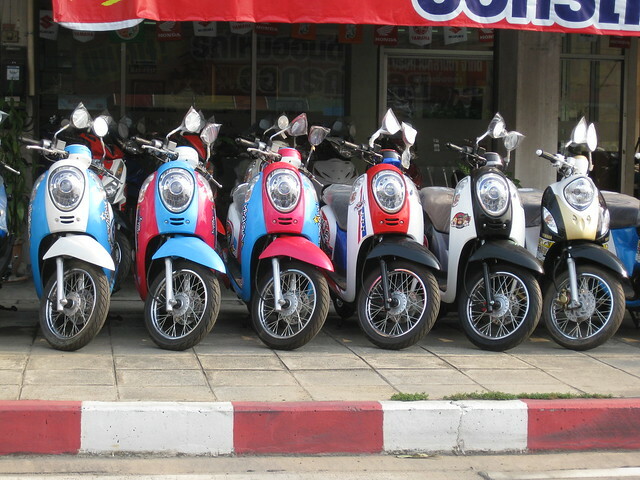 Motorbikes are a popular mode of transportation in Thailand. So when visiting Thailand, you will see them everywhere — both locals and tourists riding them. Renting a Motorbike in Thailand is easy, too easy. Basically anyone can walk into a shop and rent one with money and a passport (or even just an ID). There is no discussion of age, ability, or insurance. Who needs details like that when you are in Thailand. Anything goes, right!?!? Hell, I’ve seen families of 5 on motorbikes, livestock on the back of motorbikes, women holding babies in one hand and sodas in the other while riding a motorbike…and yes, I’ve seen 10 year olds driving motorbikes on the highway! I’m not sure what the rules are (or if there are any), but you will have no trouble renting a bike here. We decided to rent a motorbike on our last day in Ao Nang (Krabi) Thailand so that we could visit some nearby sights more easily. We had just returned from a quiet couple days in Railay Beach, but we were sad because it was our last day in Thailand. We felt like there was so much more that we wanted to see before we left! So renting a motorbike seemed like the best way to accomplish this. Plus, all the locals made it look so easy. However, I was in for a rude awakening. These motorbikes are not like the ATV’s I rode growing up. They had a different type of accelerator, so I was not used to the handle accelerator on the motorbike. I also wasn’t used to the speed of the acceleration on the motorbike…which is really very quick compared to the ATV’s I grew up with! Combining that with the fact that I was out of practice and Josh was riding on the back of the bike with me, made for a terrible first attempt. The biggest mistake I made was having too much confidence before getting familiar with the bike. I hopped on the bike and immediately took off into traffic. I completely misjudged the speed of the take off, and Josh was bouncing around on the back of the bike, causing me to swerve all over the place! I quickly realized that it wasn’t going well, and that we were in a dangerous situation being on the main road. In a fit of panic, I immediately pulled off the side of the road to get out of traffic and stop. Unfortunately, the side of the road was filled with parked motorbikes. I tried not-so-gracefully to park the bike between them, but since I came in at a fairly high rate of speed, I ended up (lightly) crashing into a few bikes and knocking them over. Josh jumped off the back of the bike, like I was a crazy person, and refused to get back on! Trying to save face as the locals stared at me in horror (or amusement, I couldn’t tell), I tried to laugh it off while I moved the bike back onto the street. But the bike was a lot heavier than I anticipated (and a bit awkward to move around). So I ended up knocking over bikes, accidentally revving my bike engine, hitting the brakes too hard, and knocking over more bikes in the process. I also managed to gouge my lower leg somehow during this process. So now I’m bleeding, and causing a scene. Awesome. Finally, I was able to get the bike up and get it back across the street near the shop where I rented it. All this time, the shop owner was watching with a disgusted look on his face. “Stupid tourists,” I’m sure is what the was thinking. When I got back to the shop, I was shaking. I couldn’t believe how the bike scared me so unexpectedly, especially when I was feeling so confident in my abilities. I was so embarrassed at how badly I failed at riding a motorbike, I just couldn’t believe it. My pride was hurt, and I really didn’t want to let this bike get the best of me. Josh would say I’m stubborn, but I prefer to think of it as being determined. Not wanting to admit defeat, I really wanted to redeem myself. So I told Josh and the bike shop owner that I just needed to get used to the bike on the side streets first. “It was a mistake to take it on the main road right away” I told them. But they didn’t believe me. The shop owner basically walked up to me and snatched the keys out of my hand. We had the bike all of 10 minutes. And he didn’t give us our money back. And so ended our first experience renting a motorbike in Thailand. UPDATE: I Have Redeemed Myself! Check out our post about successfully riding a motorbike in Chiang Mai, Thailand! Redemption in Chiang Mai, Thailand! Wanna Visit Thailand? Check Out Our Complete Thailand Travel Guide!